Some good news on the baseball diamond on a day Cats fans need it, Kentucky sweeps Canisius to open up Kentucky Proud Park with five-straight wins and to get back on track. In game one, Kentucky’s ace Zack Thompson was once again dominant. After striking out five batters in the first two innings, Thompson was well on his way to a career-high 11 strikeouts in six innings of work. He also only gave up two runs and six hits. Three of those hits came via infield singles. Despite being down two runs early, Kentucky had their fourth comeback win of the season. Heading into the seventh, Kentucky was down 2-1 after a TJ Collett scored Zeke Lewis on a rare infield single from the powerful Collett, but that changed quickly when the Cats hung five runs on the board. The Seventh began unconventionally with pitcher Grant Maccochi being brought on to pinch hit, where he drew a walk. He would reach third on a single from Breydon Daniel then Jaren Shelby knocked him in to tie the game. Collett gave Kentucky their first lead of the game on an RBI single, but the big blow in the inning came on a Coltyn Kessler two-RBI single to give the Cats a four-run lead. Kentucky would tack on four more in the eighth, also helped by Kessler. He finished with a career-high three RBIs and tied his career-best with two hits, including a double. Kentucky would go onto win 10-2, and Zack Thompson improved to 2-1 on the year. In game two of this series, despite the cold weather, the Kentucky bats were hot with 12 runs. As I’ve mentioned quite frequently early this season, Kentucky has gotten a lot of production from the bottom of their lineup, and game two was no exception as Zeke Lewis had four RBIs out of the nine spot in the order. Not known for his power, Lewis had to get his runs with the help of small ball, and the same applied to the rest of the Cats today as well. Kentucky got most of their runs via sacrifice outs, but they burnt up the bases as well with six stolen bases, three of them coming from Breydon Daniel. One great example of small ball Kentucky used was a trick play that allowed Breydon Daniel to take home. In the 4th inning, Ryan Shinn baited the Canisius catcher by falling down at second. Naturally, the catcher threw the ball down to 2nd base, trying to catch Shinn slipping(literally), but once the ball went to 2nd, that allowed Daniel to swipe home. Brilliant play. Even though the use of small ball was prevalent, The Cats still made sure to get their power in with two big blue bombs. The first one came off the bat of Ryan Shinn in the 3rd inning with a 375 ft. opposite field shot to extend his on-base streak to nine games and the Kentucky lead to three. The reigning two-time JUCO home-run king, Dalton Reed, has been a great addition to this brand new Kentucky roster. His bat has been hot to start the 2019 campaign, and he continued his tear with a two-run shot in the bottom of the sixth. Dillion Marsh was terrific on the mound this afternoon as he picked up his first win on the year. Marsh started the game by facing the minimum and holding a no-hitter through Four and a thirds innings. After going five strong innings, he was pulled in the sixth. He ended his day with three hits, two walks, and two runs on three base hits. He had six strikeouts as well. In his absence, the collective effort from Degen, Daniels, Johnson, and Cottongame was near perfect as Alex Degen was the only pitcher to allow a hit and a run out of relief. Dylan Marsh is 1-1 on the year as the Cats took this one 12-3. In game three, the Bat Cats once again had a comeback victory. This time, being down 3-2 going into the bottom of the fifth Jaren Shelby was the hero with a two-RBI single that was set up by a TJ Collett. The Cats would hold that lead due to three perfect innings by Cole Daniels and Hunter Rigsby in relief. While Daniels was credited with the win, it was a solid effort by both of them regarding high-praise. While the least amount of runs Kentucky scored in this series came in this game, there were a few offensive bright spots. For starters, Ryan Shinn’s on-base streak has reached ten games now. Shinn has been red hot to start to the season and hopefully, he won’t cool off anytime soon. Another bright spot was this two-run big blue bomb that Breydon Daniel obliterated back in the third inning to put Kentucky on the board. Kentucky would win this one 4-3 to sweep Canisius. After a horrible weekend in Lubbock, Texas the Cats had their groove this weekend in what was a special week. This week saw the grand-opening of Kentucky Proud Park, and Kentucky went 5-0 this week to improve their record to 8-3. Kentucky will look to extend on their five-game win streak and stay undefeated at KPP when they take on Wright State in Lexington, Tuesday at 4:00 pm ET. As always, you can catch the game on 98.5 FM Lexington on the UK Sports Network or SEC Network+. Just two games in at Kentucky Proud Park and we already have a classic. Dalton Reed hit a walk-off single in the bottom of ninth to cap off a four-run ninth inning and send the BBN home happy with a 5-4 victory over Northern Kentucky. It was Kentucky’s first walk-off hit since 2016. Kentucky went into the bottom of ninth down by three runs with the bottom of the order due up. The bottom of the order, who has generally produced, did their job and got the line up to roll over with one out and runners on the corners. Breydon Daniel did his part in batting in Elliott Curtis to draw the Cats within two. Needing to rally late, down by two with one out and bases full of Cats, TJ Collett stepped to the plate trying to end it with one swing of the bat. He was able to knock in two runs to tie the game at two on an RBI single, which set things up for Dalton Reed after the intentional walk of Jaren Shelby. With the bases loaded, Dalton Reed hit a shot up the middle to send Kentucky home with a win. “Baseball is a game that’s supposed to be fun,” Reed said. “So, things like that make everything even more special than it already is.” Reed also got a nice bath after the clutch hit. After the game, Coach Mingione said his team’s competitiveness fueled them to rally late. Mason Hazelwood was stellar on the mound today. In fact, he was nearly perfect. Hazelwood retired the first 16 batters he faced in this one, carrying a perfect game into the 6th inning. His streak was eventually ended on a double by NKU’s Billy Marion. Hazelwood also had the strikeout pitch working as he finished the day with a career-high 11 strikeouts in just six innings of work. Facing one-hitter over the minimum through six innings of work in your first career start isn’t too shabby. After Hazelwood left the game, things broke down for Kentucky in the seventh inning. After Mason Hazelwood only allowed one baserunner through six innings, Coach Mingione turned Tyler Burchett out of the bullpen. Burchett doubled the only batter he faced, then allowed him to advance to third on a wild pitch. Not being able to finish facing two batters, Cole Ayers came in for relief. After finishing Burchett’s batter with a strikeout, Ayers walked the next man and gave up an RBI single to tie the game at one. With two outs and bases loaded, NKU would capitalize on a double and an error by Cam Hill, who couldn’t field it cleanly that allowed three runs to score for the Norse. It was a full team effort to bring the Cats back, and Kentucky sent four different freshmen to the mound after Sophomore Mason Hazelwood left the game. After giving up four runs in that dreaded 7th inning, the young bullpen kept things at bay to set up the ninth-inning comeback. Alex Degen and Cole Daniels only allowed one base runner after NKU’s four-run burst. Some other notes in this one, Ryan Shinn extended his on-base streak to seven games and Marshall Gei had a career-high three hits in this game. Kentucky will be back in action for a weekend series against Canisius. The first pitch will be Friday at 4 pm at Kentucky Proud Park. You can see the Bat Cats on SEC Network+ or 98.5 FM Lexington on the UK Sports Network. What a great win tonight as the Cats improve to 5-3. Go Cats. On a day of firsts, Kentucky got their first victory in Kentucky Proud Park, a 7-3 win over EKU in front of a crowd of 4,074, the 10th largest crowd in program history. Things got going for Kentucky in the 5th inning. Already up 1-0, TJ Collett hit the first home run ever in Kentucky Proud Park with a two-run blast to push the Cats lead to 3-0. To keep it going in the 5th inning, Jaren Shelby got to have a little fun breaking in the new turf infield when he stole three bases in one inning; yes, you read that right. Shelby took second, third, and, most importantly, home. Shelby would go on to steal second and third in the 6th inning. With Shelby reaching base via a walk and an error, I can’t say I’ve looked at many box scores to see a clean-up hitter go 0-4 with five stolen bases in a game. Ryann Shinn kept his on-base streak alive this afternoon with a walk and a hit. He’s now reached base in six straight games. Dalton Reed has proved to be a formidable force in this lineup as well. The JuCo transfer had another double today, Kentucky’s first hit in KPP. He scored the first run in KPP as well, on an error by EKU 2nd baseman Ryland Kerr. After giving up a grand slam to the first batter he faced in relief this season, Grant Macciocchi had an excellent day on the mound. Macciocchi started his day with a three-pitch inning in the opening frame, then retired the next 11 hitters, facing the minimum through four and two-thirds innings. Macciocchi finished with six strikeouts, allowing three hits, one walk, and a run through five and two-thirds innings of work. A cool moment came when two former Rockcastle County Rockets faced off with the bases loaded in the bottom of the 9th. Freshman Hunter Rigsby faced off against his teammate in the batter’s box, Brent Lovell with EKU down six in the ninth. Rigsby was the better Rocket in this matchup as he got his old friend to lineout to third keep the lead at six. EKU tried to rally back with two runs late, but it wasn’t enough as Kentucky opened KPP with a 7-3 victory. After the game Coach Mingione emphasized on just how special this game was. If you missed your chance to make it out to Kentucky Proud Park, you won’t have to wait much longer. The Bat Cats will be back in their new home tomorrow to take on Northern Kentucky at 4:00 pm ET. If you can’t make it out, you can catch UK on SEC Network Plus or 98.5 FM Lexington on the UK Sports Network. Kentucky improves to 4-3 on the year. Go Cats. If there were run rules in baseball, they definitely would have been applied today, as Kentucky suffered the sweep in the Lone Star State, losing to Texas Tech 19-4. It has been a disappointing weekend for the Bat Cats. Kentucky struggled, blowing two leads in the first two games of the series. But today was the worst of them all, as the Cats didn’t hold the lead one time in this ball game. Big innings have been the backbreaker for Kentucky in this series, giving up two six-run innings in the first two games – today was no different. Only this time, Texas Tech seemingly hung a crooked number in every inning. Having yet another six-run inning in the 3rd, a four-run inning in the 4th, a three-run inning in the 6th and, to cap it all off, a four-run inning in the 7th; Kentucky’s pitching was no match for the Red Raiders. Kentucky sent eight pitchers to the mound today to try to figure out an answer for this Red Raider lineup, but none of them prevailed. Starter and losing pitcher Dillion Marsh only went two innings, giving up six runs in his short time on the mound this afternoon. He also walked five batters in and surrendered six hits before being pulled. The collective effort from the bullpen didn’t provide any relief either, as they surrendered 13 hits and walked seven more batters as a whole. One bright spot out of the bullpen was Tyler Burchett, who made his debut in the blue and white this afternoon. In his first appearance, he only surrendered one walk to carry the limping Cats to the finish line. Texas Tech’s right fielder had himself a day with a whopping seven RBIs off three hits. He got the bulk of his RBI’s on a three-run blast in the big 3rd inning for the Red Raiders. Brian Klein also contributed big numbers for the Red Raiders; he had four hits and four RBIs on the day. On the offensive side for the Cats, Jaren Shelby was a bright spot, as he was responsible for three runs in today’s contest. The Lexington native went for two RBIs on two hits, and he scored a run as well. Ryan Shinn kept his on-base hot streak up as he reached base in all three at-bats he had this afternoon, but the way he got on base was very unconventional. Shinn was hit by the pitch in all three of his at-bats. If you thought his day sounded fishy, get this: Texas Tech pitchers hit Kentucky batters seven times in this contest. I’m not sure if that’s some sort of record, but if I were a betting man, I’d say it was pretty close. On the bright side of things, Kentucky will debut their new, state of the art Kentucky Proud Ballpark Tuesday at 4:00 pm as they take on EKU. 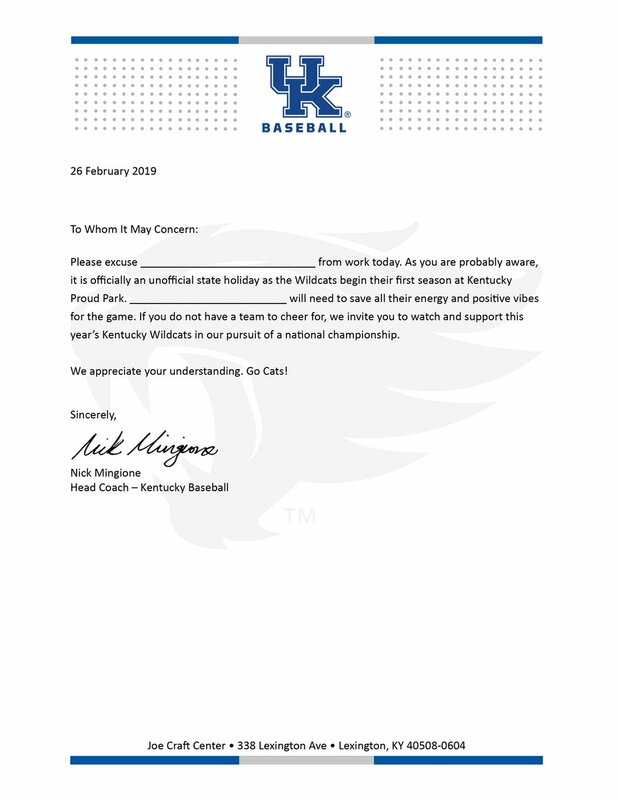 You should be able to make it to Kentucky Proud Park’s debut on Tuesday after all: Kentucky baseball has provided you with an excuse from work. But, in the unfortunate circumstance you can’t make it to the game, you can watch the Cats attempt to stay above .500 and get back to their winning ways on SEC Network+ or tune in on 98.5 FM Lexington. Forecasts say it will be a beautiful day for February baseball, with it being sunny and temperatures sitting in the 50s. The Swimming and Diving team finished the 2019 SEC Conference Championship with a historical performance. The women finished third overall for only the third time in school history and the second time in the past three years. The men finished seventh overall, making the best finish in seven years. Who knew Cats were so good in water? Kentucky drops their series against Texas Tech, losing 10-7 in a very windy Lubbock, Texas this afternoon. The momentum went back and forth, just like the 45 MPH winds in the game, but the most significant game shifter came in the fifth inning. After a big top half of the inning for the Cats where they put up four runs, Texas Tech took no time to respond. The Red Raiders scored six runs in the inning to take a commanding 8-5 lead. That’s the second time this series Texas Tech put up six runs in an inning to overtake a Wildcat lead. If you remember in yesterday’s game, the six runs came from a collective effort from The Red Raiders, but in this inning, the big blow came from Dylan Neuse. After starting pitcher, Jimmy Ramsey gave up two doubles and a single that scored a run to start the inning, Mingione went to the bullpen to have Mason Hazelwood to bail the Cats out of the jam. Unfortunately, Hazelwood walked the only two men he faced to load the bases and score another to make it 5-4. After that, Mingione went to Grant Macciocchi to deal with the tough task of getting Kentucky out of a bases loaded, no out, situation. But, the first person Macciocchi faced was Dylan Neuse who went yard for a grand slam, his second home run of the day. Neuse hit a home run, that was helped by the wind gusts, back in the 2nd inning to give the Red Raiders a 2-1 lead. Neuse finished the day with five RBIs. If the box score didn’t serve as a good indication, It was not a great showing on the defensive side of things for the Cats. Kentucky had four errors in this afternoon’s contest. Two of the errors came from Alex Rodriguez, both coming before the game had reached the third inning. The other two errors came on a play that you would see in little league. In the 8th inning, Dru Baker had a ball fall in for a hit, but Jaren Shelby miss played a ball in right field that resulted in Baker advancing. As Baker was heading for third, Zeke Lewis sent the ball into the Kentucky dugout that allowed Baker to score. A little league home run, if you will, that allowed Texas Tech to go up 10-7. The pitching staff had a tough go of things, as well. Starting pitcher Jimmy Ramsey only made it four innings, giving up five runs and seven hits. Ramsey didn’t really have a hard time keeping the ball in the zone, as he didn’t surrender a walk, but the Red Raiders were all over him. Four of the hits he gave up were doubles, but the wind helped the ball carry for both teams, to cut Ramsey some slack. Alex Degen and Hunter Rigsby would carry the Cats to the finish line, but both gave up a run in their outing. On the bright side, Kentucky’s offense did hang up seven runs on the board with a lot of production coming from Ryan Shinn. Despite Kentucky’s two losses, Ryan Shinn has arguably been the best player this entire series. Before this game, Ryan Shinn had gotten on base in seven straight plate appearances. Today Shinn extended that streak to 10 with two leadoff doubles and a three-run home run. But his streak would come to an end in the 7th via strikeout, but his performance will all but surely reward Shinn SEC player of the week honors. Let’s not forget the catch Shinn made last night. He shoulda brought a beach towel because @TheRealShinny laid out to secure this WEB ?! Jaren Shelby and TJ Collet both had sacrifice RBI’s in this game. Shelby’s coming in the 7th to bring the Cats within one run of the Red Raiders, making it 7-8. Collett’s happened in the fifth to tie to game at two. Kentucky also got some production from the bottom half of their line up, as Alex Rodriguez had a run and an RBI out of the seven hole. Marshall Gei scored a run out of the eight spot in the sixth inning, which was set up from the RBI double by nine-hole hitter, Zeke Lewis. Hopefully, the Bat Cats will get on track tomorrow as they try to avoid the sweep. First pitch is at 2:00 PM ET tomorrow. You can catch the game on Fox Southwest plus, or 98.5 FM Lexington. Heading into the season ranked 13th in the nation, the lady Cats on the diamond have stumbled out of the gate a bit to start the 2019 season. After losing three of their five games in the Houston Invitational, all by just one run, the Cats were derailed by third-ranked Oklahoma on Thursday. But, this weekend the Cats have had a better go of things, with Rachel Lawson picking up her 400th win on Friday against Utah, The Cats looked to put two more in the win column yesterday against Texas and Oregon. After dropping the first game to Texas, the Wildcats were ready to get some revenge on the Ducks. Oregon has ended Kentucky’s season in the super-regionals the last two seasons. Last year Kentucky was just one game from Oklahoma City and the College World Series until the Ducks rallied and won the next two games to send Kentucky home. But, yesterday was a different story as the Cats run-rules Oregon ending the game in just five innings 12-3. Madisonville native Mallory Peyton had a big day, as she hit a two-run home run to end things in just five innings. On the weekend Peyton has four home runs, 10 RBIs, and six extra-base hits. Katie Reed and Abby Cheek had home-runs as well that helped Kentucky’s blowout efforts, but one of the biggest plays came from Kelsee Henson when the senior from Paducah was called on to pinch-hit in the bottom of the third to extend UK’s lead to 5-0. Jenny Schaper had a good day at the plate as well, as she ended with two hits, two RBIs, and she scored a run. Kentucky will wrap up the Elite Invitational in Clearwater, Flordia tomorrow against James Madison. It will be Kentucky’s fourth game against a ranked opponent in as many days. First pitch is set for 1:00 PM and you can catch the game on the ESPN app. Kentucky’s star freshman Rhyne Howard just pulled in another nomination for another national award. Howard has been added to the watchlist for the 2019 Cheryl Miller Award. She’s one of just 10 finalists. The annual award is in its second year and recognizes the top small forward in women’s NCAA Division I college basketball. Howard’s freshman season has been special since the very beginning, when she became the first player in the Matthew Mitchell era to score at least 10 points in each of her first 10 games. Now, she’s averaging 16.8 points per game to go along with 6.6 rebounds – she leads the team in both of those categories. She’s second in successful 3-pointers (60) and second in steals (53). She has four double-doubles so far this season. These stats put her at the top of the conference – she leads all SEC freshman in points per game by nearly six points and rebounds per game by two boards. She also leads league rookies in steals, while placing second in assists and 3-point shot percentage. Today’s news comes just a day after Howard was named SEC Freshman of the Week for the sixth time this season. She’s only the second player in league history to do that and the second Kentucky basketball player ever to win that award at least six times. The other? Brandon Knight. Now that Howard has been named to the top-10 list for the Miller award, she just has a few more obstacles in her way en route to the trophy. Five finalists will be announced in March, and the winner will be revealed during the Women’s Final Four in Tampa. Kash Daniel is one of the most popular athletes we’ve seen at Kentucky is a long time. Now, the legend of the Mountain’s Mascot, Kash “Money” Daniel, has grown even further now that he has joined UK’s bass fishing team. A two-sport athlete in fishing and football? Pure badassery. Today at the Kentucky Sport Boat and Recreation Show, Kash took some time out of his day to meet with some fans, participate in some mini-fishing games and spoke to us media folks. Here’s everything Kash had to say today. Kash will only get to spend one season with Kentucky bass fishing team, after clearing it with coach Stoops, but this isn’t Kash’s first competitive rodeo on the water. “I’ve been competitive fishing since I can remember with my dad in local tournaments in my area,” Kash said. ” I started fishing by myself in local tournaments when I was 14 or 15 Dad would drop me off, then come back and pick me up to see how I did. It’s something I like doing I can still be competitive, but also it’s kind of like my getaway.” Kash also said his favorite place to fish in Kentucky, is Kentucky lake, for any of you looking for great fishing recommendations. To any kid looking for an inspiration to follow their dreams, look no further than Kash Daniel. 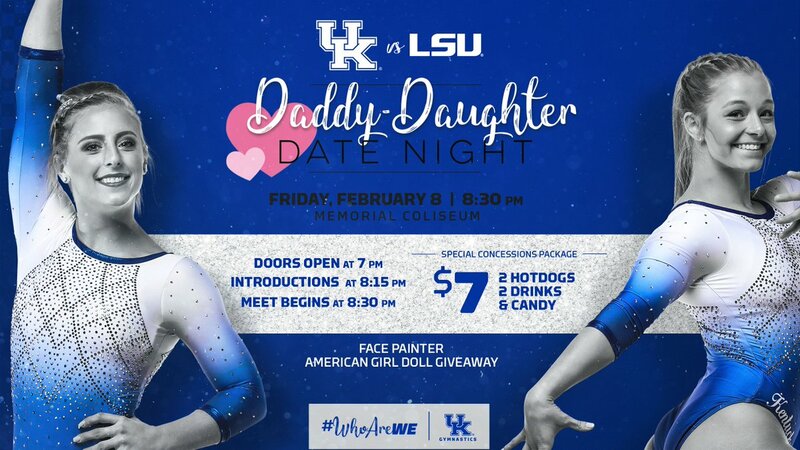 Kash Daniel is a wrestler through and through. His ability to cut promos, communicate with fans, and his character work is impeccable. Not to mention he has the look and voice, Kash would have a great future in the WWE. Since he’s already a two-sport athlete, what could stop him from making it three? WWE superstars Karl Anderson and Luke Gallows seem to think he could pull it off. Kash also said he expects the linebacking core to pick up right where they left off. This year the Cats will bring Jared Casey, and JJ Weaver, along with the three-headed monster that’s already in place with Kash, Boogie Watson, and Josh Paschal. Kash Daniel, UK’s first dual-sport national champion? Man, Myth, Legend. It’s been a big day for Matthew Mitchell and the rest of the women’s basketball team. After defeating Florida by 11 points, the Cats have more exciting news: they’ve picked up an in-state guard for their 2020 class. Erin Toller, who attends Sacred Heart Academy in Louisville, has committed to Kentucky. She announced the news on Twitter, explaining some of the hardships and heartbreak that led her to the Wildcats. After suffering multiple knee injuries and dealing with the tragic loss of a friend, Toller made sure to thank her family, coaches, friends and trainers for sticking with her through the recruitment process. ESPN has Toller listed as the No. 16 point guard and the No. 60 overall player in her class. She’s currently listed as a 3-star prospect. Welcome to the BBN, Erin! The women’s basketball team completed the perfect trifecta against Florida Sunday afternoon – the football team and the men and women’s basketball teams have all defeated the Gators this season. Although the shooting percentage doesn’t show it, Kentucky was able to hit shots when they needed them. A 7-0 run at the end of the first quarter brought the momentum back to the Wildcats, and the game was tied 15-15 by the break. At halftime, Kentucky had pulled ahead, and the Cats went to the locker room with a 30-23 lead. Another game changer? Maci Morris, who finished with just 10 points for a rather quiet night, sank a beautiful three-point bucket with under two minutes left in the game. Although the Cats had the lead before the successful trey, Morris’ shot felt like the straw that broke the Gators’ back. Morris has now hit at least one three-point shot in 100 of her 119 career games at Kentucky. The Cats finished with 35 rebounds, led by junior Amanda Paschal. The guard finished with a career-high and a team-leading nine rebounds, while freshmen Blaire Green and Rhyne Howard each contributed five boards. Collectively, the Cats scored 16 points off their rebounds, plus 16 more off of second-chance points (aided by 16 offensive rebounds). The Gators nearly matched the Cats’ number of rebounds (34) but they were far less efficient in terms of turning those boards into points. Florida scored just seven points off rebounds and just eight second-chance points off seven offensive rebounds. Kentucky finished with just nine turnovers, while they forced the Gators to lose possession 24 times. The Wildcats were able to turn those mistakes into 31 points, which made a huge difference in the game. The Cats finished with 16 team fouls, while the Gators had 22 against them. And when Kentucky got to the line, they were very successful – UK finished 17-22 from the charity stripe for 77.3 percent. Florida, on the other hand, finished the game 8-16 for 50 percent. Taylor Murray was the difference maker for this stat line: the senior point guard hit 11 of her 13 free throws. For a game recap, click here.